When choosing a name for your business you want it to be simple and easy to remember. This guide is about name ideas for homemade pet treats business. I am starting a business baking dog treats and I need a snappy name for my business. I am looking for suggestions. Thanks. Yes, I liked the 'snappy' too. Snappy Dog, Dog snaps, something with word snap in it. Something To Bark About or Treats for Fido (Fido means 'Good Dog' in Latiin. A little Something Extra For A Special Hungry Dog. Who's Barking Now? Fido Needs Something Special Too! And last is my favorite_ Don't forget Fido On Your Way Home! How exciting for you! I have tried doing the same but just couldn't afford all the laws behind it. I wish you well! Have fun with it! "Forno di Fido" Bakery for Good Dog - in Italian! The Doggie Baguette? Maybe I'm spelling it wrong, but you get the idea. Best to you in your new, dog-centric endeavor! I am starting a homemade pet treat business that makes treats for small animals (rabbits, rats, mice, hamsters, etc.). The main treats I sell are for hermit crabs, but some treats can be given to small animals as well. I live in Lancaster, PA and the majority of my ingredients are bought at bulk country stores which sell organic ingredients. I was thinking about "Lancaster Hermit Treats and More" as well. Thank you everyone I actually ended up going with Lancaster Treat Co.! Thank you for all of your great suggestions! My shop will be opening soon so feel free to check it out! I am in the start up phase for a homemade dog biscuit company and am looking for a cute, but easy to remember, name for it. Any suggestions? Why not borrow a name from the show Providence and call it The Barkery! I live in the country in a log cabin. I am starting to make natural dog treats; I have 2 dogs. I need help with cute name. I wanted "cabin" or "country" in the name. I was thinking Country PUPkins. Your name sounds fine. Log Cabin Dog Treats is another suggestion. 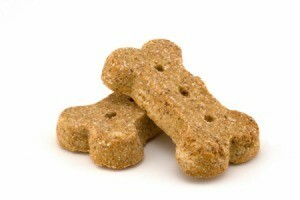 What is a good name and slogan for an organic dog treat and biscuit? Barking Delight - Watch your dog bark and wag is tail with delight. Doggy Organic Treats - There's nothing fake about organic treats for your dog. Doghouse Organic Bits - Only the best for your best friend. Doggy House Delights - Treat your dog like he's a king.